Looking for a new blow torch for plumbing and don’t know where to start? No problem. This quick-fire review has got EVERYTHING you need to know about the best gas torches on the market today. There’s a tonne of different blow torches on offer. Just jump onto any plumbing ecommerce store and see for yourself. Which one you decide to buy essentially, boils down to one of two things. We’re not going to bore you with reviews of 20, 10 or even 5 torches. Instead, we’ve listed details for one of each torch, based on the above. If you’re new to the plumbing/gas fitting game, you’re about to hear Rotherberger’s name pop up A LOT, almost every time you search for tools. They’re known as being one of the higher end brands in the plumbing tool space. So, they produce good stuff, but you’re certainly going to pay for it. First up, if you’re comparing this (especially price-wise) to plumbing torch kits, the Rothenberger typically comes as a “torch only” deal. So, it’s not a full kit, and that means buying other bits (like gas) separately (yes, more money). And, that’s going to make soldering a pain-in-the-backside. 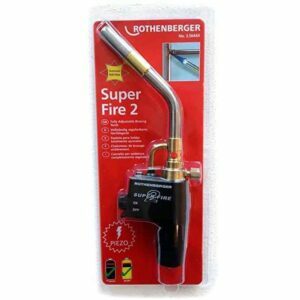 Rothenberger used the base of the original Super Fire, and then made it MUCH better, to come up with the Super Fire 2. That means high levels of heat concentration, and that makes your soldering work not just easy, but more importantly, consistent too. Soldering at angles and upside down? No chance. The gas distribution to the Super Fire 2’s outlet is consistent, so soldering upside down or at angles is an absolute breeze. You’ll get an Instant Piezo ignition. That’s not just reliable, but durable too. So, you’ll spend more time soldering, and less time clicking away, wondering if you’ve ran out of gas. And, when it does ignite, there’s an anti-flare and adjustable flame built-in. And, there’s also the option to grab additional adaptors. The burn tube is made from heavy duty stainless steel and accepts a range of gas cylinders. The stainless steel is touch enough to prevent any form of gas leakage if it’s dropped, so it’s much safer than the cheaper untested soldering torches on the market. The jet’s filtered, and that means your not going to end up with a gas flow problem. 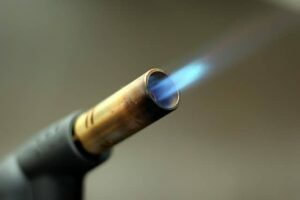 Naturally, the Super Fire 2 blow torch has been designed specifically for plumbers as well as heating and gas engineers. But it’s also suitable for air conditioning and refrigeration professionals. Like all Rothernberger blow torches, the Super Fire 2 isn’t just about being durable. If you’re soldering all day, the last thing you want is a torch that’s ridiculously heavy. And that’s definitely not the case here. The Super Fire 2 weighs under 700g. I always check out online reviews of a product I’m planning to purchase, especially if I’ve not used it before. The best thing about Rothenbergers soldering torch? It’s got an absolute tonne of reviews. And these reviews cover things that fill you with enough confidence to make a purchase. Especially when there are blow torches on offer for a little bit less that you’ve been thinking about buying. In fact, it sometimes uncovers things you might not think of. A lot of the reviews on ecommerce stores suggest this is the best torch for those not soldering typical copper pipe sizes (i.e. 15mm, 22mm and 28mm). And to be able to be precisely solder 8mm one day and 54mm the next, you’ll need a highly sensitive adjustable flame…which is exactly what the Super Fire 2 has. Nothing from Rothenberger is “cheap”. But, that’s not their focus with any product they offer. Their products are about NOT letting you down and standing the test of time. And that means value for money. There are plenty of no-name brands offering something similar (but definitely not the same) for 20-30% less. Our view? Don’t bother, the few quid you save you’ll get back 10x over, just through the consistency of the soldering work you can achieve via flame adjustment on the Super Fire 2. So, we’d be heading for the Rothenberger, but what about if you don’t want to spend that much cash? There are other options. In fact, search any ecommerce store and you’ll see there are a tonne of cheap plumbing blow torches on offer. The cheapest? We’d completely avoid them. But, you can grab the Monument Tools soldering torch for around £15 less than the Super Fire 2. And, there’s also a good deal on the Torch + Gas Deal. At my time working in a plumbing merchant, we sold a tonne of tools from Monument with no complaints. So, this is where I’d be heading if I wanted something cheap, but not “imported from who-knows where” cheap. Like the Rothenberger, this is a torch only deal. One thing that is worth mentioning is that Monument have spent a lot of time making this comfortable to use. There’s a focus on an ergonomic fit to your hand that few other blow torches on the market have. And, that means if your soldering all day, you’re not going to be getting RSI in your hand or wrist any time soon. Using the Piezo ignition, you’ll then be able to adjust the turbine flame to make it super-concentrated. So, that’s going to make soldering copper joints of all sizes no problem at all. Once it’s ignited, you’ll get the usual flame lock. This torch isn’t just designed to be used for all types of soldering (i.e. angled/upside down), it’s comfortable. Soldering at angles isn’t exactly good on your joints, and this is again where the ergonomics of the Monument Tools gas torch comes into its own. The Piezo ignition is the same used on the Rothenberger. And, that means it’s not just going to fire up instantly, it’s going to ACTUALLY last. So, no, you don’t need to keep a lighter handy in case the ignition fails! It’s got the usual compatibility with Propane/MAPP gas. You’d expect the Rothenberger to be lighter, but it’s not. The Monument weighs just 522g, and that makes this one of the lightest plumber’s blow torches on the market. A brand like Monument is always going to have a tonne of positive reviews on their products. And, that’s certainly the case here. There are over 100 reviews online, with plumbers buzzing about how good the Monument is, and how cheap it is compared to the competition. And the best bit? You don’t need to have the budget of the Super Fire 2. You’ll be saving anywhere from £15-20 withthe Monument (depending on current best prices online) in comparison to the Rothenberger. Rothenberger Super Fire 2, Or Monument? So, which one’s actually the best, considering the price. It’s definitely an apples versus oranges situation. If you have the budget and want the best plumbers blow torch, I’d get the Super Fire 2. It’s a torch designed for plumbers and gas fitters soldering for extended periods on a daily basis. But, if you want to save a few quid, the Monument is a solid choice. This isn’t a low-quality no-name brand supplying untested cheap products. Just like the torches, there’s a tonne of brands offering gas online. If you’re looking for gas and want to grab it from a well-known brand, Rothenberger have their gas on offer online. There’s a good chance you’ve seen cheap plumbing torches online, some are nearly half the price of the Super Fire 2 mentioned above. So, why not just buy one of those instead? There are two reasons; soldering precision and reliability. Brands like Monument and Rothenberger have been making soldering torches for plumbers for years, and that means they’re the best in the business. But more importantly, they’re products are reliable. I’m not sure about you, but I’d sooner have a torch I know isn’t going to let me down, rather than saving a few £ now, only to lose that (and more), when I have to ditch out from a job to go and grab a new torch from the local merchants! Thanks for reading our 5-minute review of plumbing gas torches. Got a torch your happy/not happy with? Drop a comment below – we’d love to hear what you think of it. And, if you still have any questions, leave a reply below and we’ll get back to you as soon as possible.